Yoga has been around for thousands of years, but it’s only in recent times that the ancient discipline has become popular among the masses. To put that in perspective, the number of Americans doing yoga grew by 50 percent between 2012 and 2016. To many the appeal of yoga is in the unplugging from it all. Practitioners aim to quiet their minds as they disengage from the world around them. As such, taking yoga in a higher-tech direction—employing gadgets and electronics to aid the experience—seems almost like a contradiction in terms. Yet, in some ways, even this ancient practice is succumbing to the changes of our modern, ever-connected world. Some boutique yoga studios are using video to enhance the experience. 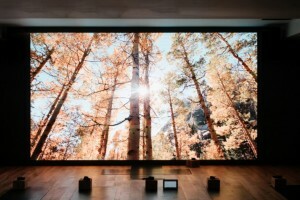 London’s FLY LDN leads members through a vinyasa flow in front of a 20-foot 4K video display projects immersive and vibrant cinematic visuals, from Himalayan mountain ranges to crashing ocean swells. Alongside curated music playlists, the screens elevate the sense of escapism and relaxation. Another cutting-edge yoga studio is ChromaYoga, also in London, where light and color therapy, brain-stimulating soundscapes, and natural scents are combined to create an immersive, multi-sensory experience. Using the latest scientific research on the effect that specific light frequencies have on our bodies, the studio’s founder, Nina Ryner, believes that saturating ourselves in different hues during yoga can address “imbalances in our lives.” Rooms are bathed in a specific color of light depending on the class, each with a teacher instructing sequences designed to correspond with the healing properties of that color. 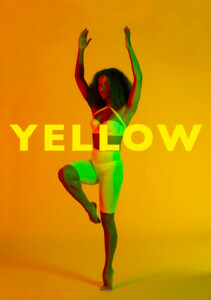 Take the yellow class, for example, and you’ll experience a flow meant to aid digestion and mood swings. When Apple unveiled the latest edition of its Watch last summer, it added yoga as a dedicated option for its fitness-tracking capabilities. And a startup called Pivot Yoga is developing a smart clothing line that provides feedback through small internal sensors that can indicate whether the user is posed correctly. The clothes maintain a wireless connection to the company’s mobile app, through which you can take online yoga classes. The sensors will insert a “live avatar” of your body into the video so you can easily compare your movements with the teacher’s.